In the DS1515+ there are two memory slots, an internal slot that contains the factory installed memory and an expansion slot. The expansion slot is easily accessible by removing the outer case of the NAS. Unfortunately, the NAS is VERY picky about what kind of RAM it will take, and Synology only gives you some basic specs on it. They really want you to buy their expensive branded memory module. I didn’t want to spend an extra $50-$125 on a 4GB “upgrade” module that would only give the device I just paid $650 for a total of 6GB of RAM. 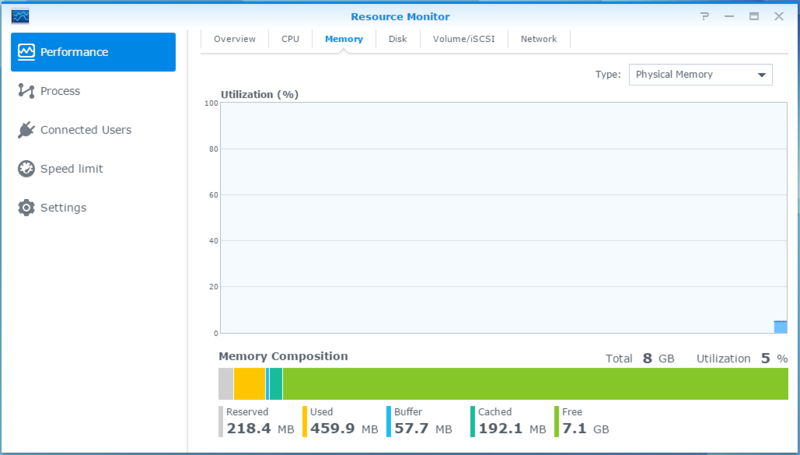 After spending some time on the Synology Forms I found that the best way to do all of this was to just replace the Synology installed module and replace it… People have been able to add up to two 8GB sticks of ram giving the DS1515+ 16GB of total memory. I decided to just try it out with a single module. And it all worked well! Just had to pop out the hard drives, remove the factory module, and install the new module. Only took a few minutes of time and just have to be a little careful not to smash anything around when angling in the new module through the space open above the processor. The module that I used was the Crucial 8GB Single DDR3 1600 MT/s (PC3-12800) CL11 SODIMM 204-Pin 1.35V/1.5V Notebook Memory CT102464BF160B, available from Amazon for $49.00. Once the module is installed, just boot it up and it should recognise the new module and you should be good to go! The boot after changing the module took about 10-seconds longer than usual. So give it a little time after powering up the NAS. If the device doesn’t boot, the blue power light just flashes, you might have the incorrect module or have connected something incorrectly, go back over what you did and replace the factory module if needed. thanks for the info, but can’t you just add the 8GB module to the already existing 2GB module, making it a 10GB ram space? That would be nice, however, the Synology RAM is very picky and doesn’t work with many 3rd party modules. If you purchase the Synology modules, they work fine, but 3rd party modules generally wont work with the Synology module installed. Did you try (2) of the 8GB modules listed to get 16GB in a DS1515+? No, I only did one module; for me 8GB was more than enough. 2 should work just fine though, since they would be matching. The issue with the Synology installed module is that it’s obscure and hard to match with other modules.